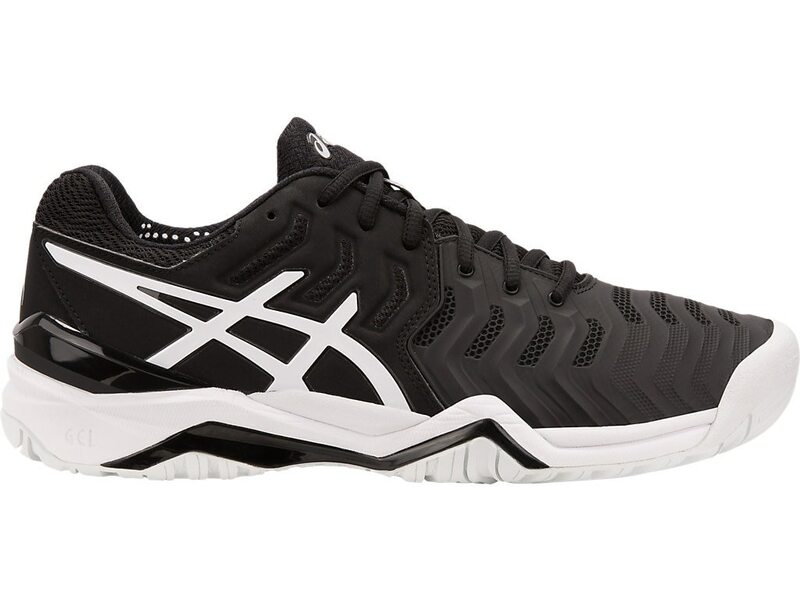 Our GEL-Resolution® 7 Novak shoe provides maximum stability with a lower external heel counter and redesigned FlexionFit® upper for midfoot support and comfort. The durable super AHAR® material is strategically positioned on the outsole for the ultimate resistance to wear and tear on the hard court. *Novak Djokovic edition* Weight: 13.4. PRODUCT FEATURES 6-MONTH OUTSOLE WARRANTY Warranty against excessive outsole wear up to 6 months. GENDER-SPECIFIC CUSHIONING Women's models feature a lower-density top layer in the midsole, allowing female athletes to better enjoy the benefits of midsole compression. FLEXION FIT® UPPER Proprietary upper which provides form fitting comfort without sacrificing support. REARFOOT AND FOREFOOT GEL® TECHNOLOGY CUSHIONING SYSTEM Attenuates shock during impact and toe-off phases, and allows movement in multiple planes as the foot transitions through the gait cycle. PGUARD™ TOE PROTECTOR Enhanced toe durability. SOLYTE® MIDSOLE MATERIAL A lighter weight midsole compound than ASICS standard EVA and SpEVA® midsoles. Also features enhanced cushioning and durability. TRUSSTIC SYSTEM® TECHNOLOGY Reduces the weight of the sole unit while retaining the structural integrity of the shoe. I.G.S® (IMPACT GUIDANCE SYSTEM) TECHNOLOGY ASICS design philosophy that employs linked componentry to enhance the foot's natural gait from heel strike to toe-off. AHAR® PLUS OUTSOLE Strategically positioned in critical areas of the outsole, this exceptionally durable compound is 50% more durable than standard ASICS High Abrasion Rubber. P.H.F™ (PERSONAL HEEL FIT) COLLAR LINING 2 layers of memory foam line the collar and mold to the athlete’s heel, creating a personalized fit.